MOUNT KISCO, Mount Kisco - We invite everyone to visit our open house at 90 Foxwood Circle on February 1 from 12:00 PM to 2:00 PM. 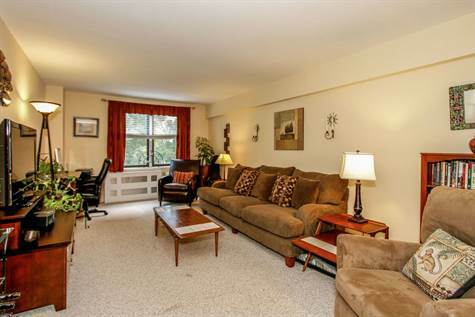 MOUNT KISCO, Mount Kisco - 2 bedroom updated corner unit with balcony and private eastern exposure with plenty of natural sunlight. This sponsor unit does not require coop board approval. Comfortable sunny and spacious living room, updated eat-in-kitchen, 2 large bedrooms with generous closet space throughout and updated bathroom. Walk to train and town, and close to highways for an easy commute. Short stroll to town to enjoy an abundance of restaurants and shopping. Residents of Tara Close enjoy a pool and unit includes 1 assigned parking space. Second space can be obtained for additional charge. 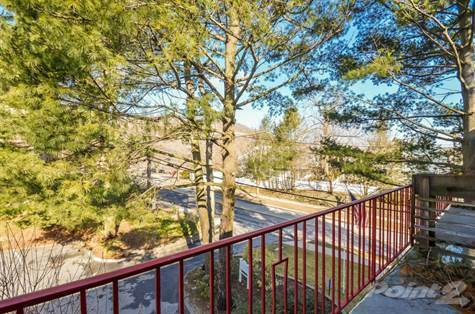 MOUNT KISCO, Mount Kisco - OPEN HOUSE SUNDAY FEB 1 at 12noon-2pm---	Updated corner unit with 2 Bedrooms, 2 Baths, Living Room with door to Balcony, Dining Area, Kitchen with updated appliances, wall to wall carpet, tiled foyer & kitchen floors & wall air conditioning units. Enjoy privacy on the Garden Level with distant western tree top views. 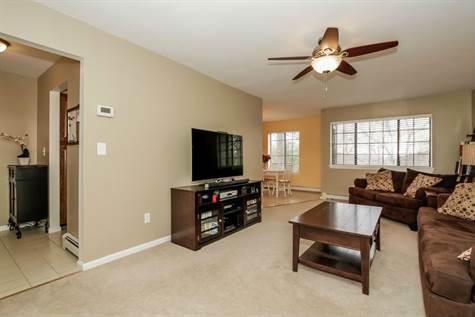 Come see this bright corner unit freshly painted, stainless steel stove in the kitchen & updated Master Bath & hall bath. Extensive Closets in the unit with closet organizers in Master BR & about 60 square feet locked additional storage space conveniently right outside unit. Each unit in the complex boasts Washer/Dryer in the unit, pool, clubhouse, heat & hot water included in common charges & short distance to town, train & highways for an easy commute. This unit is on the garden level, with privacy & condo shows like a model unit. Taxes don't reflect STAR of $1130. Plenty of unassigned parking available for guests. Assessment of $56 month for parking lot repaving, exterior painting & retaining walls ends 12/17. There is contribution to capital building fund equal to 2 months common charges at closing by the buyer. Mount Kisco, Westchester County - The 3 story at 28 Barker St #B3 has been sold. Kent, Carmel-Kent-Mahopac Area - Charming 19th century antique farmhouse set on 1.1 acres with rocking chair front porch, original architectural moldings and trim, beautiful hardwood floors, lovely solid wood doors with detail, wonderful nooks and crannies for storage and guest room on first floor as well as 4 bedrooms on 2nd floor, a private wooded yard and secret garden for play area or quiet reflection. Plenty of space for the gardener in you. Above ground oil tank and new front porch floor are among recent updates on the home which has been lovingly maintained by the same family since 1915. Home being sold as is. 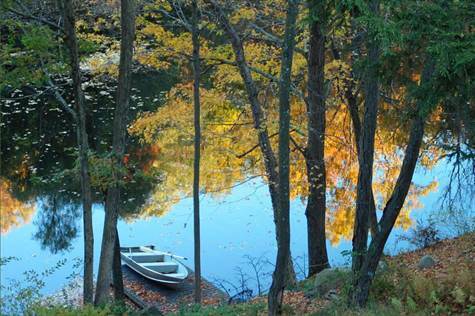 Pound Ridge, Westchester County - Enjoy exceptional Twin Ponds Lake views from this bi-level country retreat with a private dock for boating & swimming. Walls of windows providing abundance of natural light, 2 stunning stone fireplaces, open floor plan & 2levels of Brazilian IPE hardwood decks with steps down to the lake makes entertaining year-round a pleasure. Completely remodeled & energy efficient in 2000, new gourmet kitchen for your chef, great room with oak beamed cathedral ceiling, beautiful hardwood floors, new roof added in 2009. and Master Bath updated in 2014. 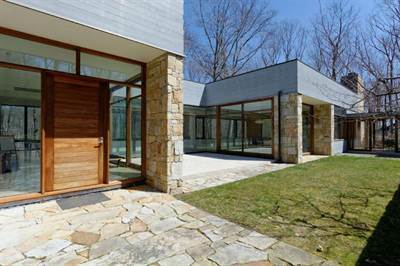 Pound Ridge, Westchester County - An example of 20th century Modernism, this 7700 sq ft minimalist style home by Ogawa Depardon, successfully combines dramatic design elements w/the environment. An architectural masterpiece, w/soaring walls of glass, stone floors & natural limestone hues highlight the natural appearance of wood & stone accents throughout. Open staircase leads to garden-level LR w/17'ceiling, gleaming Brazilian walnut flrs & sweeping 2-story glass wall affords view of the pond, 6.5 ac of woods & rock outcropping. Bedford, Westchester County - Announcing a price reduction on 21 Dogwood Road, a 2,500 sq. ft., 3 bath, 4 bdrm 4-level split. Now MLS $769,000 - . Bedford, Westchester County - We invite everyone to visit our open house at 21 Dogwood Road 4 Bedroom home in Bedford Village on quiet cul-de-sac on October 20 from 1:00 PM to 4:00 PM. 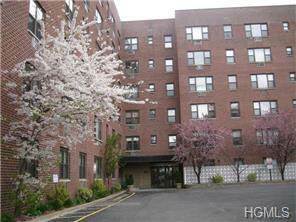 Mount Kisco, Westchester County - Well appointed, bright & freshly painted 1 Bedroom unit. Bathroom & Kitchen boast updated custom cabinetry, counter tops, SS stove, ceramic tile floor. Dine in the cozy eating area or out on the balcony. The spacious Living Room enjoys triple window overlooking wooded area. Laundry in the building & assigned outside parking $40/month. Waitlist for Garage parking $60/month. Monthly maintenance doesn't reflect current STAR deduct of $90.50/month. Take a short walk to train, shops & abundance of restaurants. Mount Kisco, Westchester County - Commuters Dream! It Has All Been Done For You With Updated Kitchen And Baths. Move In And Begin To Enjoy The Large Balcony Off The Living Room With Scenic Tree Top Views, Large Walk-in Closets, Abundance Of Natural Light Throughout This 2 BR/2 Bath Unit, Laundry Conveniently On Every Floor Just Steps Down The Hall From The Unit, All Just Steps Away From Metro North Train And The Village Shops and Restaurants. For additional charge there is either garage or outside parking. 25 Barker Street #513 in Mount Kisco is Sold! Mount Kisco, Westchester County - This special 3 bedroom with 2 1/2 bath townhome that was walk to town & train, located at 25 Barker Street #513, has been sold. Contact Margot Friedlander to discuss your homes current value and to help you get your home sold.